I took a walk today in San Miguel de Allende. Walking in San Miguel is always a joy… as long as you watch your step to avoid a missing cobblestone, or a broken curb. Your walk can take you past 400+-year-old buildings, elegant Colonial churches, houses painted in jewel tones. The sun will more than likely be pouring down from a crystal blue sky. And you’ll pass many an interesting person, both Mexican and foreign, who are all part of the show. an overgrown bit of peace. But sometimes you want a quiet walk, just for a few minutes, and a bit of nature. And you don’t want to drive or taxi all the way up to El Charco, the town’s Botanical Garden, which is one of its ecological gems. So when I took my walk today, I headed to the northeast edge of town. There, water comes down from El Charco and gathers in the Presa del Obraje reservoir. It spills over and through the dam into an arroyo. The stream threads its way through the lower part of town before spilling into the Rio Laja. In the rainy season, it pours and races. In dry times it’s barely a trickle. In 1991, when one of the upstream earthen dams burst in heavy rains, it raged, overflowed its banks, and wiped out several houses and part of the market at the bottom. 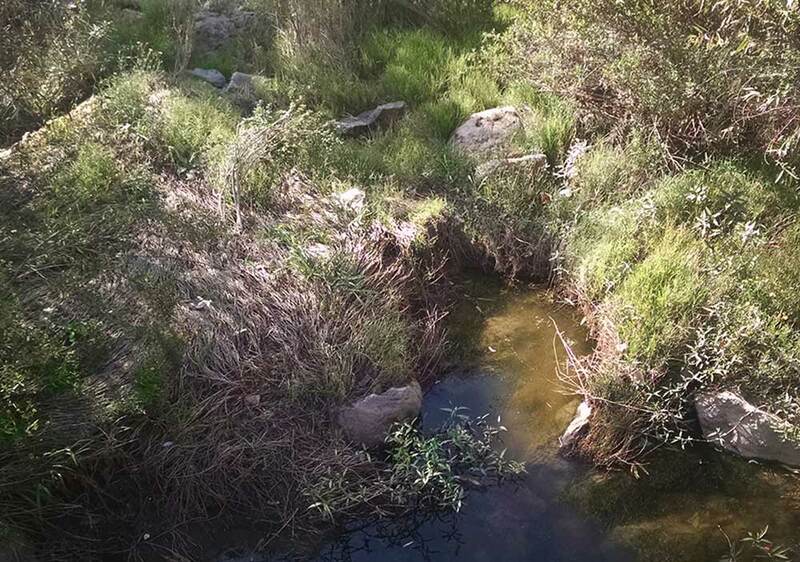 For much of its length, the arroyo is spotted with trash. As it flows down to meet Calzada Guadalupe, where it edges the San Juan de Dios mercado, it sometimes resembles an open sewer. The city talks a lot about cleaning it up. They’ve been talking about it for years. But so far, that’s mostly all it’s been—talk. One day it will happen. Land along the arroyo will shoot up in value when it becomes a popular and pretty “River Walk.” But not yet. 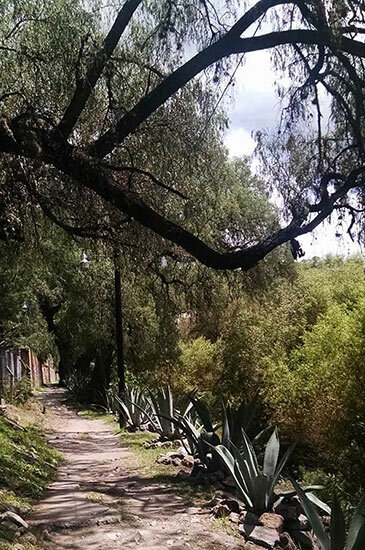 The upper arroyo that runs through the northeast corner of town is a peaceful spot for walking in San Miguel de Allende. However, there is one lovely spot for walking in San Miguel, near where the stream first enters the town on the east side. There it is still mostly fresh and cleaner where it first emerges from El Charco and heads down into town. Beginning near Calzada del Obraje, just below Calzada de la Presa, it runs alongside the Jose Vasconcelos School and beyond.Just here, the town has made a footpath, perfect for walking in San Miguel on a brief and peaceful afternoon stroll. It’s not a long walk, perhaps two or three city blocks, mas o menos. And it is lovely for those who have eyes to see it. 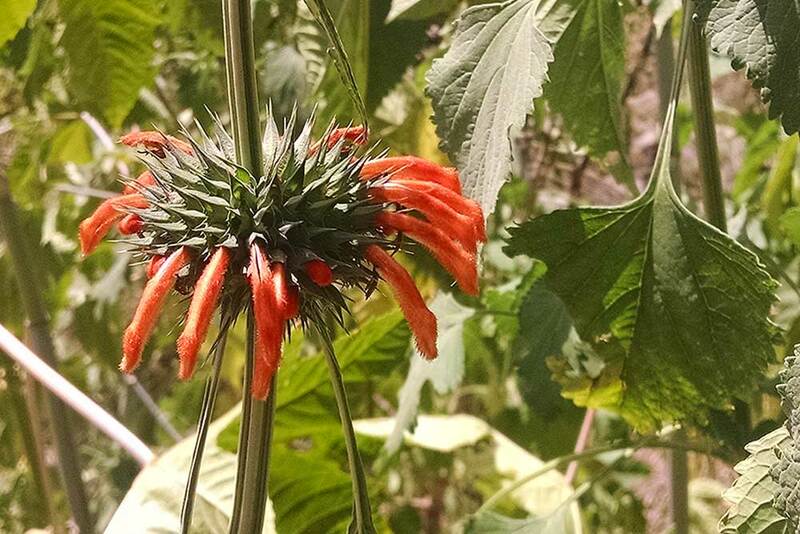 The banks of the arroyo are wildly overgrown here, cluttered with Lions’ Tails, just now flowering their orange fringe. They are really a garden plant but have apparently self-seeded here from somewhere in the city. 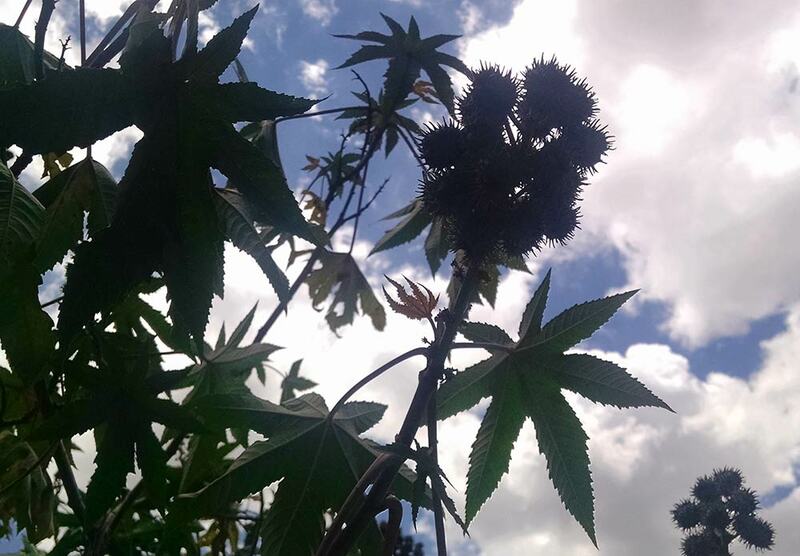 There are giant castor plants, growing wild like they do all over the countryside. Their clumps of spiny seed pods poke the air like upright grape clusters above large umbrella leaves. There is that particular rushy bamboo that grows everywhere here, and other weeds and grasses I can’t identify. 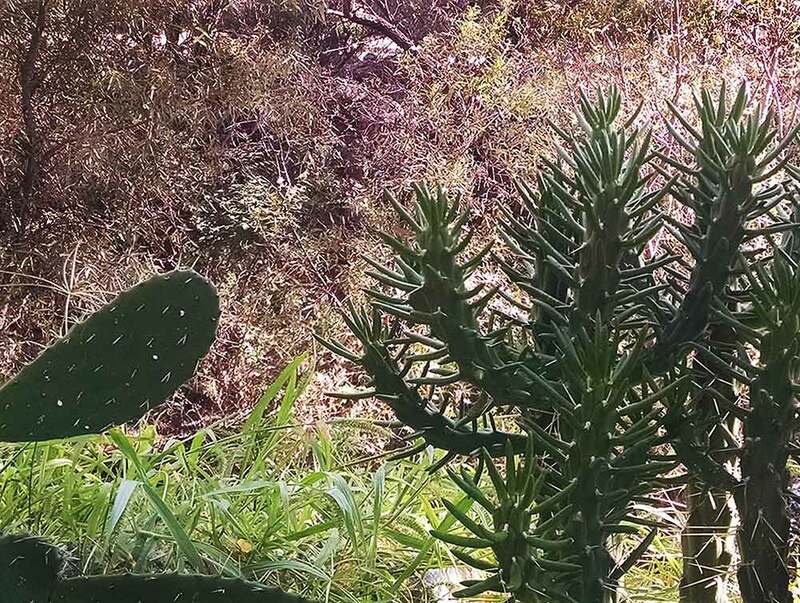 Nopal cactus, succulents and grasses grow wild along the arroyo banks. Down below me, where the water still runs, the banks are carpeted with a confetti of wild marigolds, the dependable gift of the rainy season’s end. Their golden prettiness softens the scene. San Miguel is not a particularly quiet city, with its traffic and its roof dogs and its endless fireworks celebrating who knows what at any time. Sometimes walking in San Miguel can mean dodging cars, and almost always stopping to chat with a friend encountered along the way. But here along this little path, it is quiet. I seldom see other people on this walk, although today a schoolgirl passed me with a cheerful “Buenas tardes.” Her backpack full of books looked heavy. This path was teeming with life today. A brown squirrel scampered across the path and over the rocks, heading down to the water. He was too quick and too shy for my camera to catch. Ferns and grasses waved in the light breeze, painting the banks with a palette of every shade of green. The water inched slowly by. Water pools and runs at the bottom of the arroyo, past ferns and cactus and wild marigolds. I counted half-a-dozen butterflies. There were small, flittering buttercup ones, like yellow hearts against the green growth. Another was black and gold, like a Monarch, but that makes no sense. They are well away int he far north now, storing up summer energy for their long flight back to Central Mexico come winter. I watched it a long time for a better look. I hoped it was not a stray somehow left behind or lost. I watched and waited for it to alight on a leaf, so I could study it further and maybe even snap a quick photo. It did not oblige and eventually headed off for whatever it was in search of. 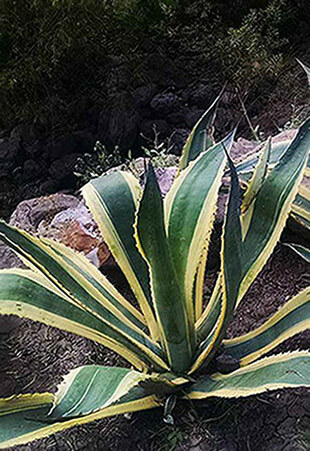 I walked past many giant agaves, some solid blue-green and others playfully striped with yellow. I love how the unfurling fronds leave their imprint on the ones beneath. For so long, they were so tightly curled together at their birth that they can never now be truly apart. They will always carry the mark of those that opened to the world before them. They are a whole family in a single plant. 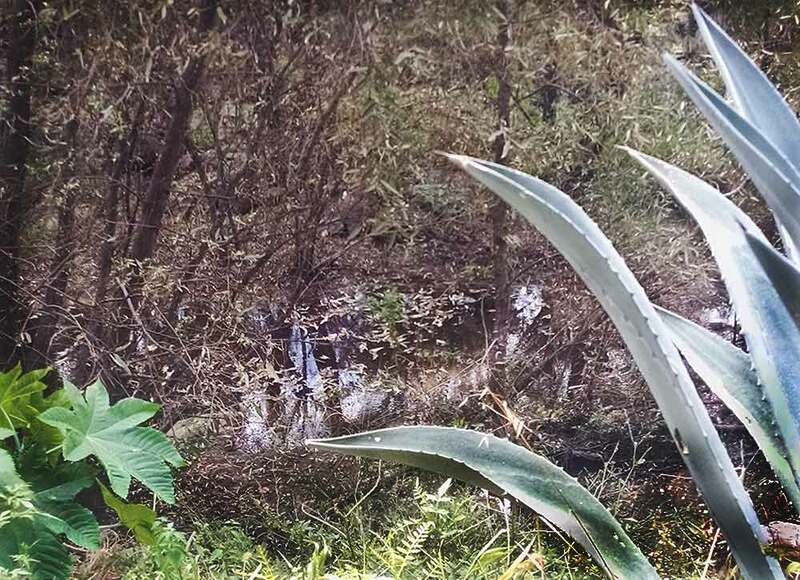 Some agaves are blue-green in color. Others, like this one, are a gaily striped green and yellow. 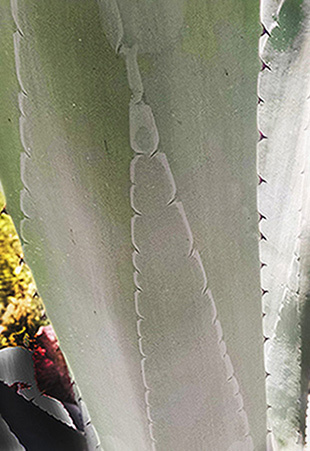 The impression left by the outer agave leaf onto the one below it is clear, from being tightly furled before opening. A tiny young plant, its leaves no bigger than a penny and its green juicy new, grew low at the base of an enormous tree. The tree is a pirule, a Mexican pepper tree. Planted on the other side of the fence, its thick main branch has leaned over the top, as if reaching for the water far below. It is old, gnarly and slowly being overtaken by ball moss, the gray-green air plants that clog its outer branches and hang down like moss. Unless someone climbs up and pulls them down—an unlikely thought—they could eventually cover the whole tree, choking off its air and light. But that will be the work of many years—probably many decades—and in the meantime, the tree offers its hosting for free. A pirule, or Mexican pepper tree, leans over the fence, offering its branches as a home for air plants. Near the end of the path, almost to the Fabrica Aurora Art & Design Center parking lot, the path is edged by a chain-link fence. Beyond that fence is the Fabrica’s duck pond. Today the white ducks busily paddled about, pecked about or serenely floated about. A pair of them had climbed up onto the pond’s center islet, tucked their yellow beaks under one wing, and were enjoying a siesta in the shade. 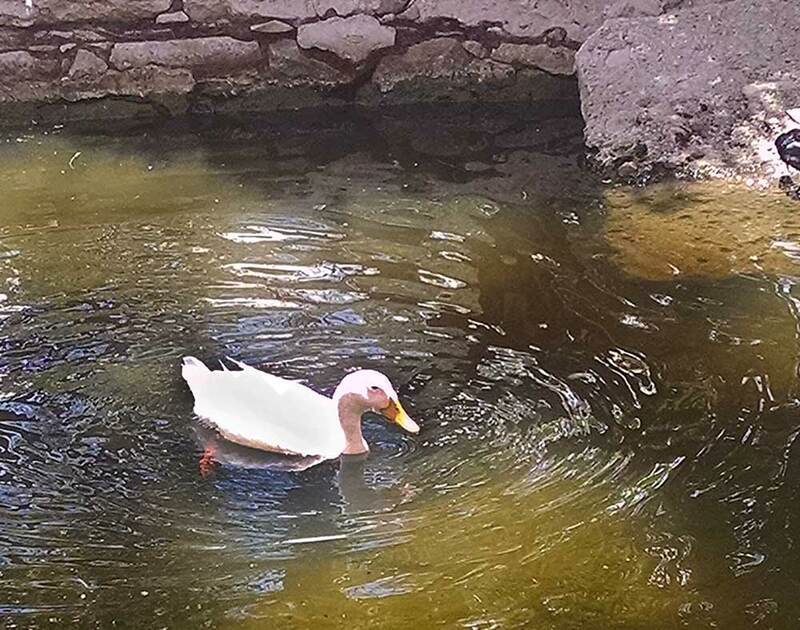 The duck pond at the Fabrica Aurora Arts & Design Center is always full of life… and quacking. My phone dinged as I watched the ducks, a signal telling me I’d stepped back into WiFi range from the nearby café. The overgrown world of the arroyo path was behind me, and I returned to my more organized and human-made one. I was back in the controlled world. I headed to Geek & Coffee, the café in the white building overlooking the duck pond, which was my intended destination all along. I sat there eating quiche stuffed with rich goat’s cheese and whole cherry tomatoes so plump they popped in my mouth when I bit into them. I drank a café latte. 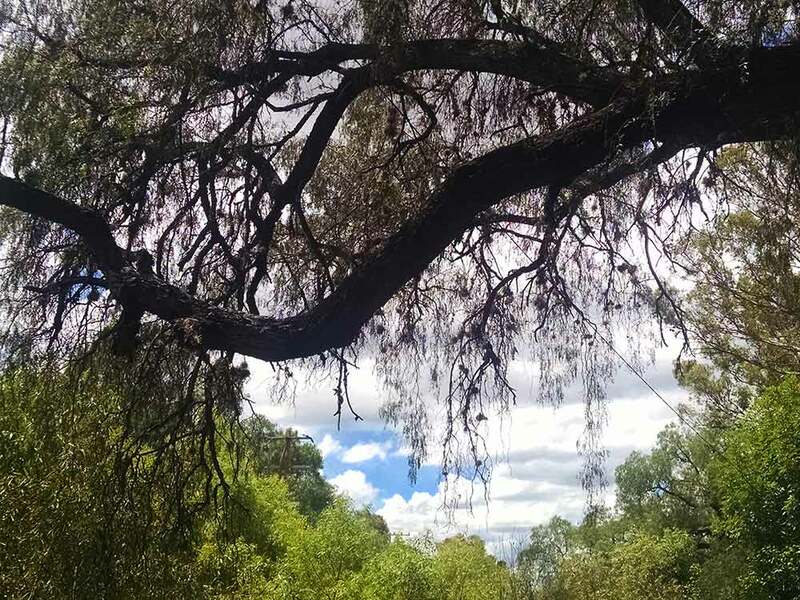 I opened my journal and began to write about walking in San Miguel de Allende, strolling along the quiet and overgrown arroyo. The easiest way to enjoy a walk along the upper arroyo is to begin at the Fabrica Aurora, where my walk ended. Go to the far end of the parking lot, away from the entrance, and take the path to the right of the duck pond. It’s easy to walk along for a short distance, enjoying the wildness and the quiet, then turn around and walk back to the Fabrica Aurora again and a good cafe latte.